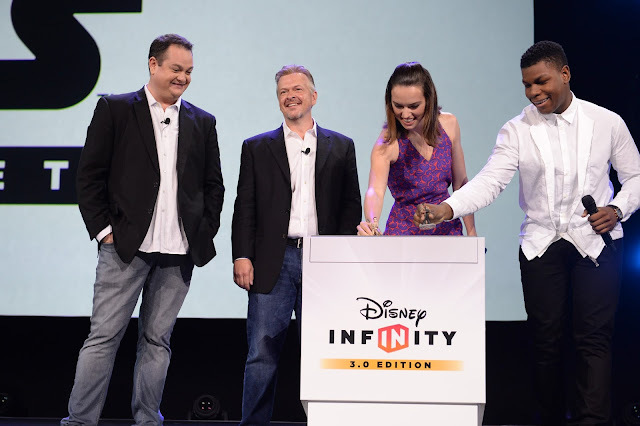 ANAHEIM, Calif. – (August 16, 2015) – Today, during a presentation at the D23 Expo 2015, Disney Consumer Products and Interactive Media revealed new details about some of the biggest products in the interactive entertainment industry including Disney Infinity 3.0 Edition, Playmation and KINGDOM HEARTS III plus two new limited edition Star Wars™ PlayStation®4 hardware bundles. · On November 17, fans will be able to purchase two very special limited-edition Darth Vader-inspired PlayStation®4 Star Wars bundles: Star Wars: Battlefront and Disney Infinity 3.0: Star Wars. The bundles include a fully customized PS4™ featuring an image of Darth Vader, a controller inspired by Darth Vader’s suit and more. For full information for the Limited-Edition PlayStation®4 Hardware Bundles visit http://blog.us.playstation.com/2015/08/16/star-wars-ps4-bundles. 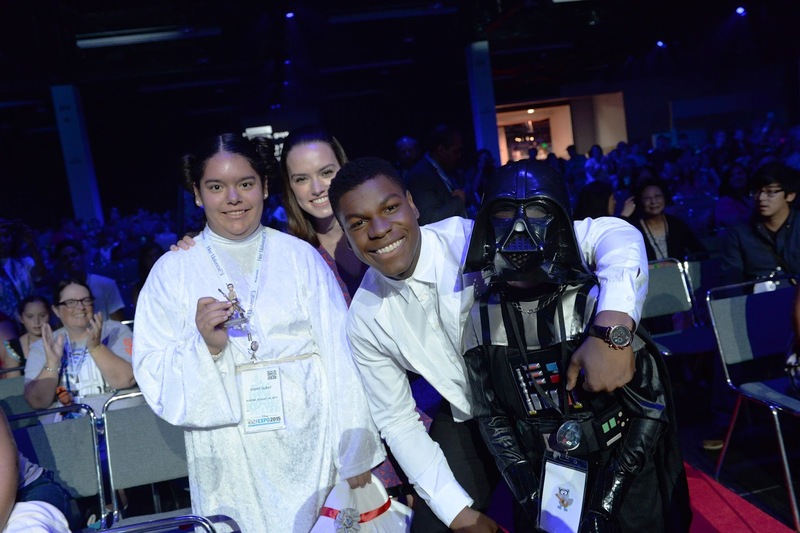 · John Boyega and Daisy Ridley, co-stars of Star Wars™ The Force Awakens, surprised guests on stage and gave away their character figures, Finn and Rey, for the upcoming Disney Infinity 3.0 Edition Play Set based on the film. Photos can be found here http://smu.gs/1JacMiq. · Other character reveals also included Nick Wilde and Judy Hopps from Walt Disney Animation Studios’ Zootopia, Spot from Disney•Pixar’s The Good Dinosaur and a limited edition set of Light FX Star Wars™ character figures that light up when placed onto the Disney Infinity Base. 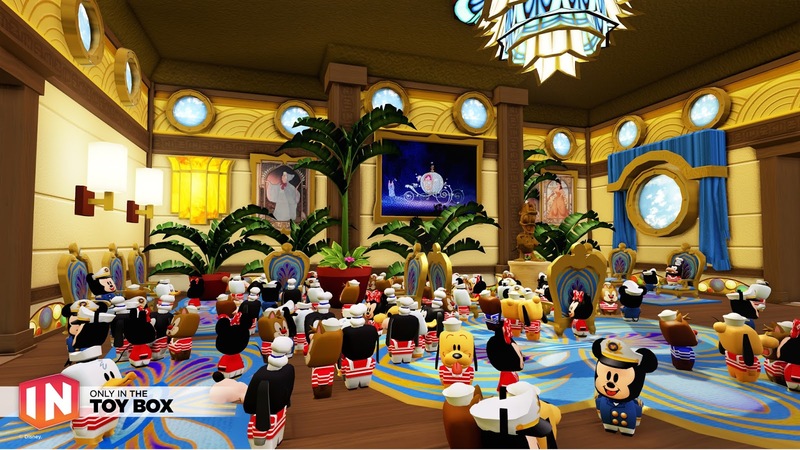 Exciting new Disney Infinity integrations with Walt Disney World and Disney Cruise Line® were also unveiled. · Guests who attended the Hall D23 received a special Kingdom Hearts Mickey Costume Power Disc that unlocks a one-of-a-kind costume of King Mickey, Keyblade Master and King of Disney Castle for Disney Infinity’s Mickey Mouse character and a classic Mickey Mouse figure. · Coming this Fall, Playmation Marvel’s Avengers Gamma Gear – inspired by the 7-foot Hulk – lets you smash into battle using motion-sensing technology putting you in the Avengers action. Slip your hands into the Gamma Gear and use the motion-based controls to smash your way through missions and stomp through battlegrounds with different Hulk moves like Ground Slam, Thunder Clap, and other combos. · Square Enix and Disney Interactive revealed that Baymax and other beloved characters of Walt Disney Animation Studios’ Academy Award®-winning filmBig Hero 6 will make their debut in the ever-expanding narrative of KINGDOM HEARTS III. 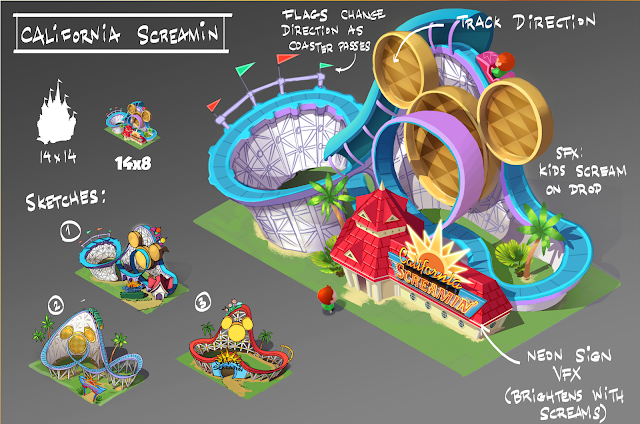 For full information about the Big Hero 6 world in KINGDOM HEARTS III visit http://bit.ly/1Kq0aEP. · Disney Interactive announced Disney Magic Kingdoms, a new mobile game being created with Gameloft that lets players build the Disney theme park of their dreams by recreating and placing iconic attractions such as Space Mountain, Haunted Mansion, California Screamin’ and many more in a fun animated landscape. For full information about Disney Magic Kingdoms visit http://bit.ly/1hgFvwo.